From our perspective, however, the most exciting improvements stem from changes made to IO Interactive's in-house Glacier 2 engine. 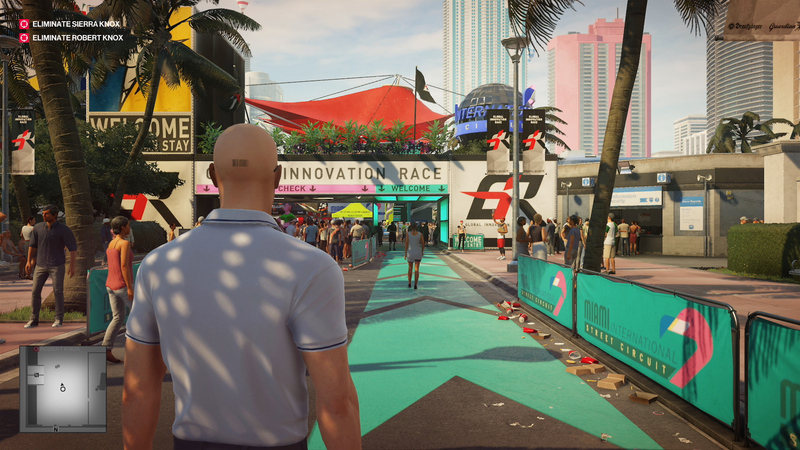 IO has spent years perfecting its engine technology to support this type of game and a few of the new features introduced in Hitman 2 are quite eye-catching. 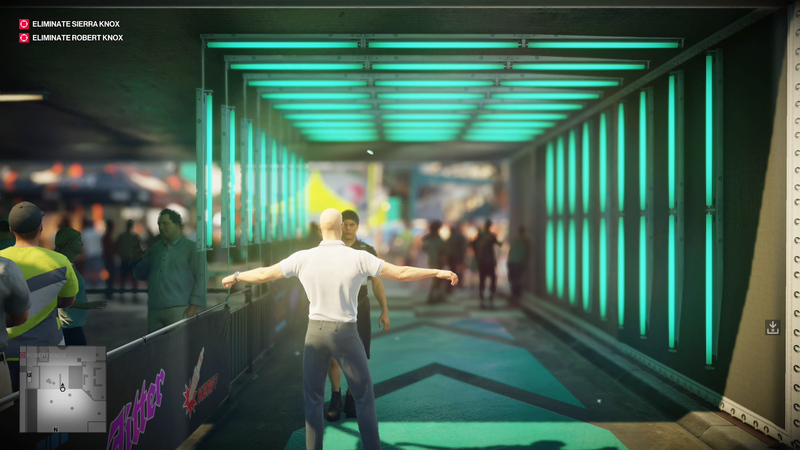 In the video below, I walk through a couple of levels to give a detailed breakdown of Hitman 2's tech - and detail is an appropriate word to use, as this game boasts huge areas packed with intricate detail and dynamic elements. There's a lot to discuss, but a couple of features are particularly worth highlighting here. Returning from the previous game is extensive use of parallax occlusion maps, which add a lot of depth to surface textures - especially noticeable on the sand in the game's opening scene. 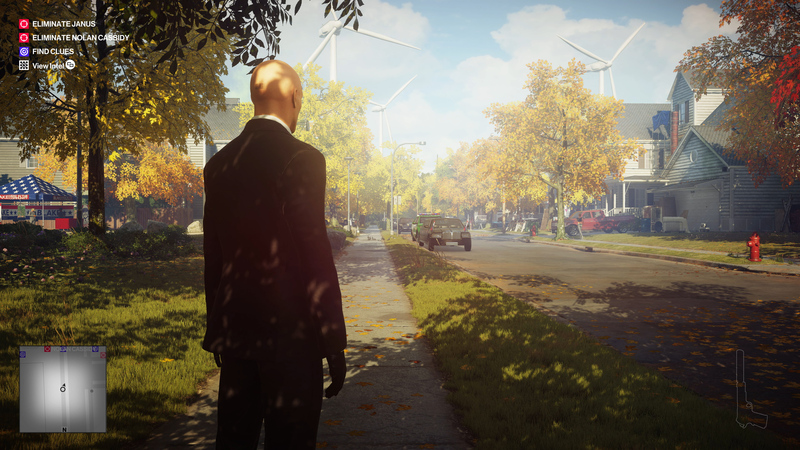 There's now thick foliage too, which is nicely animated and shaded as well as providing Agent 47 with cover for the first time. Picture-in-picture is a neat new feature that shows security camera footage and other useful perspectives on the scene. 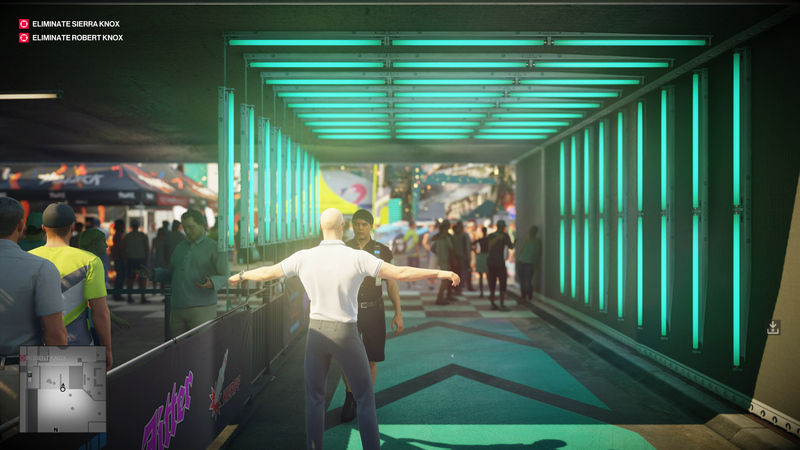 Advanced lens flares add additional vibrance to Hitman 2's look. The show-stopper, though, is the introduction of full reflections across many surfaces in the environment, well demonstrated by the huge glass windows of the house in the opening level which provide a fully animated reflection of the world outside, 47 included, as well as a view on the interior. Multiple reflective surfaces can provide several views on the scene, while mirrors are everywhere and can be very useful in the stealth gameplay. The reflections look phenomenal, but how are they achieved? Our guess is that IO is utilizing a somewhat old-school but expensive technique: render-to-texture. In basic terms, the scene is captured using a secondary camera and the results are rendered out to a texture applied to the surface. 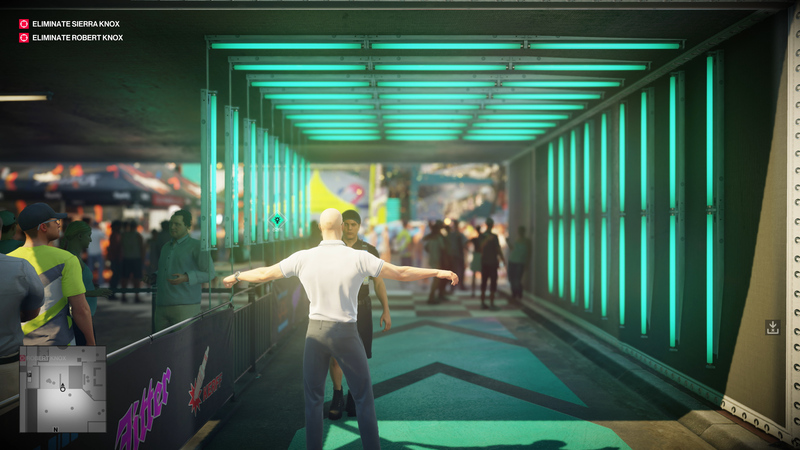 Reflections have become a big topic recently with the arrival of Nvidia's RTX ray-tracing technology, of course, but the kind of treatment they're given in Hitman 2 is rarely seen; it's expensive to render, since you're drawing the scene multiple times, with a surprisingly high level of detail and dynamic lighting present in the reflections. Really impressive stuff. A later level, set at a motor race, also shows off Hitman 2's confident treatment of huge crowds of NPC, which, like the foliage, can be used for cover. There's a huge variety of texture and model detail in the crowds which looks especially nice at higher resolutions. There are a few optimisations - the crowd's dynamic shadows are only drawn quite close to the player, fading out of view at a short distance - but the effect is convincing over all. Packed stands, lots of individual animations, stable performance and great image quality. It's a beautiful scene all around. So how do the consoles perform when tackling this beautifully rendered world? Hitman 2016 is virtually identical across Xbox One and PS4 and was updated for the newer consoles, with a magnificent Xbox One X version running at native 4K. But the picture with Hitman 2 is a little more complicated as the engine updates do make more demands of the hardware. 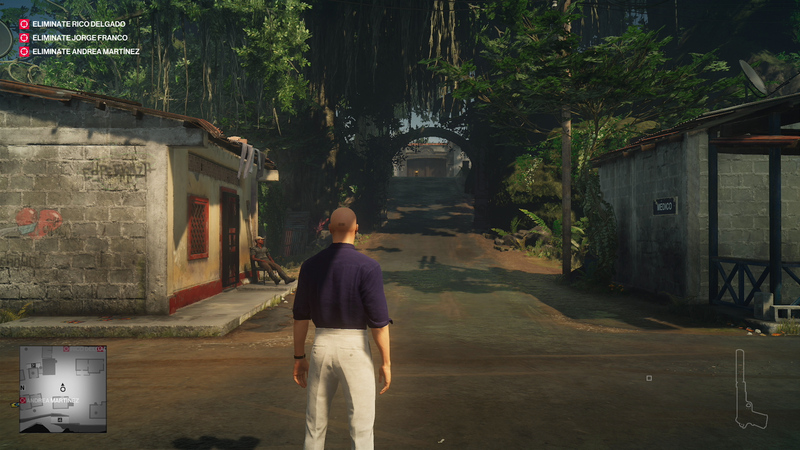 On Xbox One S, for example, Hitman 2016 ran at a resolution of 1080p, but that has now been bumped down to 900p which, in combination with the game's anti-aliasing, produces a somewhat fuzzy image. PS4 still manages a full 1080p, thankfully. On the subject of those stunning reflections, note that they appear to be rendered at a quarter resolution - so at 1080p for a 4K image, which looks fine, but at just 450p on Xbox One S, which results in a visibly pixelated reflection that doesn't look great. This feature doesn't work as well on the older consoles, but it's worth noting that it's included at all - indeed, all the game's graphical features are present and correct, barring a few subtle differences in LOD, texture and shadow resolution. Both the older consoles run the game at an extremely stable 30 frames per second. On PS4 Pro, Hitman 2 runs at 1440p, just like the Pro patch for Hitman 2016, and the framerate can be uncapped if you want to aim for refreshes above 30fps. Xbox One X offers a native 4K image, which remains capped at 30fps, or an option to display at 1440p with an uncapped framerate. The results across the two consoles are mixed. Obviously, Xbox One X offers the best image quality, but it seems as if native 4K is a little too ambitious, as the game dips below 30fps at times - only a little, but enough to be noticeable. It would have been nice to see a dynamic resolution option, or the option to run with a capped framerate at 1440p for those who really prefer stable performance. PS4 Pro, meanwhile, is much more stable when capped to 30fps, which makes sense at the lower resolution. However, running uncapped at 1440p, there's a huge gap between the two consoles: Pro dips as low as 40fps, and sometimes lower, whereas Xbox One X gets remarkably close to 60fps for long sections of play. A mixed bag, then, with the Xbox One X offering either a stunning image or high framerate, but the PS4 Pro offering the best stability with its locked 1440p30 option. One final note: there's quite noticeable input latency in all versions of the game. It's a very slow game, so it's not a huge deal, but you will pick up on it. 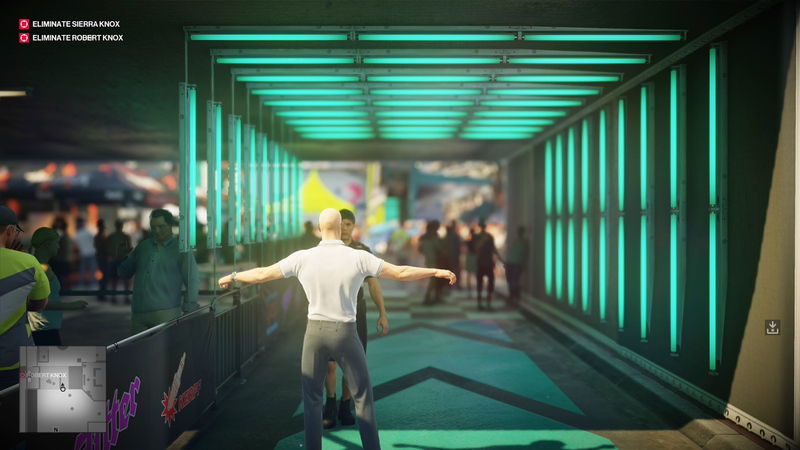 Increasing the resolution has a greater than average impact on visual quality with Hitman 2 thanks to its focus on clean lines and sharp textures. The Pro and Xbox One X versions also offer slightly boosted scenery and texture detail. Scenes packed with text tend to showcase the advantages of higher resolution rendering better than anything else. Check out the Miami Bayside sign to the right of the image - it's crystal clear on Xbox One X but virtually illegible on Xbox One S.
Bokeh depth of field is used to focus on certain actions and its resolution is tied directly to rendering resolution. On Xbox One S, the effect appears shallower than the other consoles as a result. Aside from the additional clarity, shadow resolution is improved on Xbox One X and the Pro. Distant LODs also appear slightly more detailed. Overall, though, the game is attractive across all machines. Finally, a look at Hitman 2 on PC, which is another great way to play this fantastic-looking game - but is, sad to say, a semi-incomplete package. You'll immediately notice the lack of DirectX 12 support, in contrast to Hitman 2016, and some rather limited options beyond this. Gone is the ability to determine your anti-aliasing technique, with SMAA T1x enforced throughout instead. At least it looks sharp. HDR support is there in the menu with some control options, but we could not get it working at all. The shadow quality option, meanwhile, controls the resolution of the shadows cast but distant cascades remain chunky. It can have a performance impact of as much as 22% in some scenes, but by no means all, and it also can't improve on the Xbox One X's setting, which produces shadow artifacts in some scenes. It's a little disappointing not to be able to push the shadow quality further or claw back more performance from it with this setting. Finally of the meaningful options, you can turn off SSAO for a 13% performance gain, but this is not recommended as the look of the game suffers a great deal. There are a few other options that make no meaningful changes to the game - texture quality, antisotropic filtering - but you can't control anything else. Returning to those reflections as an example, the PC version of the game, unlike the consoles, renders them at full resolution, which is nice, but an option to reduce the resolution to improve performance would have been welcome. Overall, Hitman 2 performs well, but there does seem to be a problem with Ryzen CPUs. An Asus ROG Strix Geforce RTX 2080Ti paired with a Ryzen 1700x, 16GB of RAM at 3200 mhz, an SSD and the 416.81 driver basically runs the game at ultra settings at 4K and 60fps - but not completely, with sputters and dips below 60fps due to the Ryzen in a number of scenes. In fact, the Ryzen is so limiting to performance that a GTX 1060 with an Intel Core i5 8400 and slower RAM out performs the the above combo at 1080p. To be frank, Ryzen performance here is disappointingly poor. That removed DX12 renderer could have really helped in CPU-limited scenarios, as we saw in Hitman 2016, which is a shame. Moving over to the mid-range cards, we find both the GTX 1060 and RX 580 in the same ballpark as Xbox One X. Neither GPU is quite capable of 4K30 or 1440p60 at Ultra settings, but at Medium, the RX 580 seems to manage a perfect 4K30 and at 1440p, the two cards trade blows with the Xbox depending upon the scene. And the PC version has other advantages over the console release, notably lower input latency and the absence of a strange issue where some animations and camera movements seem locked to 30fps, regardless of the overall framerate. In reality, every version of Hitman 2 has something to recommend it, right down to the wonderfully stable performance of the older console versions. If you can, though, opt for a higher-resolution output on PS4 Pro, Xbox One X or PC to experience IO's phenomenally detailed world at its best.